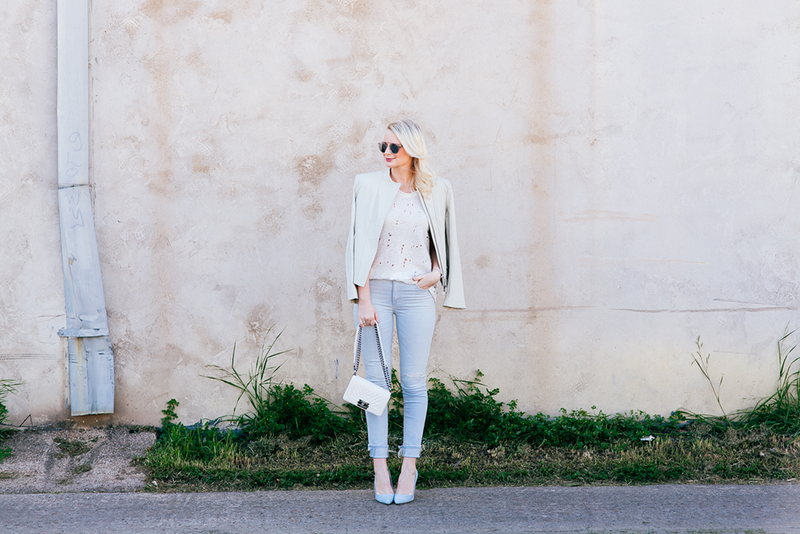 Nothing like a little pastel to get you in a spring state of mind! I picked up these bleached jeans during the Shopbop sale a few weeks back, and figured what better way to style them than with other pretty pale, powdery shades! Considering how much I wear my long-sleeved black IRO tee, I decided to pick up the short-sleeved version in white for spring and summer. Although the holes give this tee a bit of a grungy look, when paired with polished pieces like this leather jacket and my new Dee Keller pumps, it looks put together and chic. These jeans will be a nice alternative to white jeans this season, don’t you think? They’re sure to be a constant go-to in my closet with these sneaks and tees. I also wanted to remind you of my SIX:02 event with Refinery29 that’s happening tomorrow!!! If you’re in the Dallas area, I’d love for you to stop by the SIX:02 store in the Dallas Galleria between 12-4pm. There will be a DJ, refreshments, styling session with me, and the most adorable workout clothes you’ve ever seen! PS – there’s also an amazing gift with purchase… For more info on SIX:02, check out my post from last weekend. Hope to see all of you there!! these jeans are stunning, love the color. I’m seriously so in love with these shoes! The color is so pretty for spring. Obsessed with those pretty blue heels! These pastels that you have been wearing are just lovely Merritt! And can we talk about those sunglasses? LOVE! Gorgeous pics! 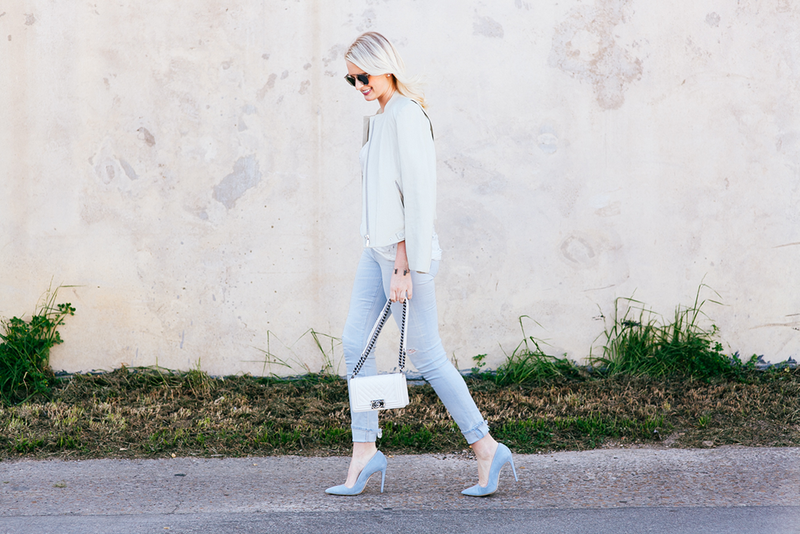 Love those light wash jeans and I’m obsessed with your blue suede heels! The small boy bag is amazing. You look great! You look gorgeous in all this pastel! These pastels look lovely on you, M! I love the idea of neutral and pastels together, its very nice and light for spring/summer :) Trust me, as much as I love dark colors, light is sometimes welcome in this NYC state. Beautiful! Love the edgy tee with the polished shoes and bag. Gorgeous pics! Love the look! What a perfect pastel outfit! I love how you paired your iro tee with more structured pieces. I have been eyeing that tee for a while now..might have to go for it after seeing how cute it looks here! Love this tee and the blue heels are gorgeous Merritt! Such pretty pastels. the colours are beautiful! Pastel colours are my favourite for Spring/Summer! Love this entire look! Looking good mama! Love this look! Obsessed with those heels! The shoes look very similar to Madewell pair, although not sure they have such a perfect spring color.